Wanted to visit Zhuhai for shopping? It only takes an hour gateway from Hong Kong! 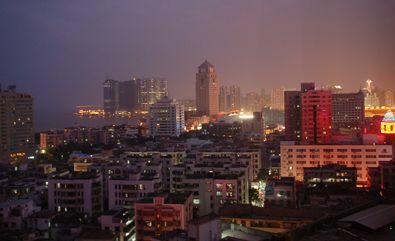 Zhuhai, China as shopping destination and a place worth to visit for many Hong Kong travelers. Zhuhai - Hong Kong is about an hour and 10 minutes direct route by ferry between Zhuhai Jiu Zhou Port and China Ferry Terminal in Kowloon. Also, Zhuhai is accessible via Macau by taking ferries between Hong Kong China Ferry Terminal in Kowloon or Hong Kong Macau Ferry Terminal in Shueng Wan to Macau Ferry Terminal with 60 or 55 minutes sailing time respectively. Zhuhai, China, is a shopper's mecca. With a huge underground shopping mall featuring hundreds of shops to pedestrian streets lined with boutiques, Zhuhai is the perfect place to find deals on everything from CDs and DVDs to the latest trendy fashions. Look for a last minute ticket to get a great travel deal and have more spending money for shopping. You won't regret it! Start your trip with a visit to the underground mall in Gongbei.Near the border crossing, the mall is easily accessible from Macau and is home to hundreds of shops. Browse for jade products, inexpensive handmade jewellery and strikingly accurate imitation watches. Don't be afraid to bargain. The shop owners here expect it and will often give you a better deal just because you asked. Head on to Lianhua Road, the pedestrian street lined with electronics stores. You can go through the bins to find copies of CDs and DVDs for half of what you would pay elsewhere. Lotus Road is the best place to find bargains on clothing and accessories. That is the spot if you look for boots, handbags and more in this district, the oldest shopping area in Zhuhai. Take a break to rest your feet and refuel with a seafood dish of local oysters or eel at any one of the inexpensive restaurants off the main road. You will need to the energy to tackle your next shopping excursion to Xiangzhou. Xiangzhou, on the #2 bus line, offers two great shopping destinations. The main street draws fewer tourists than Lianhua or Lotus but features local shops peddling bargain Chinese clothing. Head to nearby Jusco, the Japanese hypermarket, to shop for everything under the sun, including clothing, electronics and groceries, at a reasonableprice. Zhuhai is located on mainland China, and therefore only accepts Chinese currency, but most stores will happily accept Visa or MasterCard. Hong Kong citizens do need a Chinese Tourist Visa to shop and should allow three business days to receive this visa. If it is your case, you can visit the Office of the Ministry of Foreign Affairs of the PRC on Harbor Road in Wanchai during the week to set up an appointment. Bring your passport and a passport sized photo to complete the application. Visas are usually approved quickly so you can be shopping to Zhuhai in no time! Here's a detailed instruction in getting to Zhuhai from Hong Kong. Zhuhai China hotels recommended by tourist used to travel in Zhuhai and Hong Kong. A visit to Zhuhai has been made easy! Do you want to ask or share something about Zhuhai, China? How about a specific approach in getting there from where you came from? Your post will appear on a Web page exactly the way you enter it here. You can wrap a word in square brackets to make it appear bold. For example my story would show as my story on the Web page containing your story. How much is the ferry ticket for HK-Zhuahi return trip?